When we hear of antioxidant foods, we often hear of berries. Blueberries in particular are touted for their rich antioxidant content. 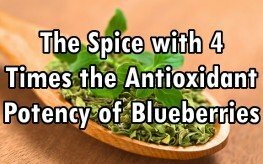 But we rarely talk about oregano—an herb with an estimated 4 times the concentration of antioxidants as blueberries and offers a wealth of additional health benefits. From adding flavor to dishes to killing antibiotic resistant infections, oregano has many uses in the kitchen and beyond. An Oxygen Radical Absorbance Capacity (ORAC) score is a number assigned to plants intidcating its antioxidant strength. Oregano is in the top five of ORAC scores when looking at spices and herbs. With concentrations of greater than 75 mmol/100g, oregano has some of the highest concentration of these protective compounds. Per gram, it has 42 times more antioxidant activity than apples, 30 times more than potatoes, 12 times more than oranges and 4 times more than blueberries. Of its antioxidants, phytonutrients are plentiful. These are protective compounds that are able to guard cells against damage by free radicals while improving your ability to fight infection. The herb also contains something called carvacol, a compound known for its antimicrobial activity. It’s carvacol that is credited with many of the infection-fighting capabilities of oregano. In Mexico, for instance, a study found oregano more effective than a common prescription to treat the amoebic infection known as Giardia lamblia. Other studies have even found it effective at fighting the resistant infection known as MRSA. Finally, you can utilize oregano oil if you want to utilize oregano in a whole other way. From being a power digestive aid to fighting cancer oregano oil benefits range far and wide. The oil, like oregano, is especially effective at fighting super bacteria and could even replace bleach in food preparations. According to scientists from the Department of Physiology & Biophysics at Georgetown University Medical Center, oregano oil could actually be a ‘new’ and ‘safe’ antimicrobial agent that could serve to replace big pharma’s drugs. Based on their research and the findings of the other scientists, the team agreed that oregano oil could be the natural and logical solution. This culinary herb can be grown in most climates or can be kept in a pot in a sunny window. For more information on growing your own oregano, check out the “oregano benefits” link just above. Thanks to the big C0-op food producers, (actually No Thanks), who use antibiotics like candy to make their so called food, (feed animals), gain weight faster, we need to be ready in case of an epidemic of a dangerous bug getting out to the human populace. Animals living on a poor diet in overcrowded conditions would not survive a year without these antibiotic. 87% of the antibiotic made in the US are given to these poor animals under the pretext they are being helped, when in actuality a better animal diet that coincides which their natural eating habits, and allowed to free range, is the solution to their raising. Corn and soy, GMO or not, is not a diet these animals recognize, and starvation will cause them to eat anything. Oil of Oregano is a great way to fight flu(s), colds, weaken immunity, and if one of these Super-bugs who has grown resistant to their antibiotics, gets out and mutates to humans. The best thing for us health-wise is a good organic diet, light exercise, and proper rest. There are times when our immune system gets down and that is when products like Oil of Oregano come in handy, since many bugs cannot survive from Oil of Oregano use. When these times come about I like to put 4 drops under my tongue and leave it there as long as I can. Then I drink water (dilutes it), swish it around and then swallow. I put a few more drops in the water and slowly drink that down as I go about my day. The Oil of Oregano under the tongue gets into the blood stream and fights bugs there and what’s in the water gets into my body to do the same. It also helps prevent a soar throat. Great stuff! None of what you said is even remotely true. Could RealityCheck give more info please? I am interested in finding out why none of the above is true. I love to get info on all things to do with health and can get very confused and I find that so often, the info that I get each day is contradictory and sometimes not easy to understand. Thank you for adding more info for us. I always thought oregano was known as a herb, not a spice. It’s an herb when you use it for health. It’s a spice when you use it for cooking. No, it’s actually always an herb.